Philosopher and physician; born at Candia June 16, 1591; died at Prague Oct. 16, 1655; son of Elijah, rabbi of Candia. Joseph received a thorough Jewish as well as secular education. At the University of Padua, which he entered at the age of fifteen, he studied logic, natural philosophy, metaphysics, and divinity; and then devoted himself to medicine and to his favorite studies, mathematics and astronomy, the latter under Galileo. While at Padua he frequently visited, at Venice, Leo de Modena, who exercised a great influence over him. Returning to Candia, Delmedigo's freethinking tendencies and his preference for secular studies soon made his residence there impracticable. For many years he led a wandering life, going first to Cairo, in search of new books for his rich library. There he associated with Karaite scholars, especially with their ḥakam, Jacob Iskandari, at whose request he wrote his works on mechanics. At Cairo, Delmedigo triumphed over a certain Mohammedan professor in a public debate on mathematics. At Constantinople, also (where he studied the Cabala), he associated chiefly with the Karaites. Going by way of Wallachia and Moldavia, he visited Poland and Lithuania. 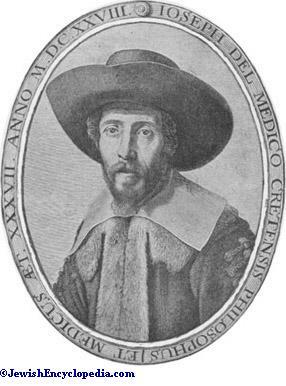 At Wilna he was engaged as physician to Prince Radziwill (c. 1620). The appearance in Wilna of a man with such a versatile intellect was a rare event. Among his pupils here was Moses ben Meïr of Metz. A Karaite, Zerah ben Nathan of Troki, addressed to Delmedigo a number of questions on scientific subjects, the answers to which constitute his "Elim." After a few years in Lithuania and Poland, Delmedigo went to Hamburg, where he officiated as rabbi or preacher to the newly established Sephardic community. An epidemic compelled him to move to Glückstadt; from there he went to Amsterdam, where he officiated as rabbi for a few years. About 1630 he settled in Frankfort-on-the-Main, and in 1631 became a communal physician. He finally, about 1648, settled in Prague, and resided there until his death. "Ya'ar ha-Lebanon" (The Forest of the Lebanon), an encyclopedia of science according to the system of the ancients. One part treats of the value of chemistry, and is entitled "Ḥefes Meḥuppas": another ("Peleg Elohim"), of various religious and state organizations. "Ẓel ha-Ḥokmah" (Shadow of Wisdom), on the reckoning of the time of day from the length of a shadow. "Bosmat bat Shelomoh" (Basmath, Daughter of Solomon), on arithmetic, geometry, astronomy, geography, chiromancy, harmony, logic, ethics, and metaphysics. Delmedigo claims to have elaborated in the "Bosmat" a system of his own. "Or Shib'at ha-Yamim" (The Light of the Seven Days), on creation and on optics. "Ḳeshet Derukah" (A Bent Bow), on the rainbow and on colors. This and the preceding are appended to the "Bosmat." "'Ir Gibborim" (City of Heroes), divided into two parts: (1) "Geburor Adonai," on astronomy; (2) "Niflaot Adonai," on chemistry and mechanics. A commentary on the "Almagest" (a part of which is included In the "Elim"). "Refu'ot Te'alah" (Healing Medicine), a medical work. "Meḳor Binah" (Source of Intelligence), the aphorisms of Hippocrates translated from Latin into Hebrew. The first chapters are included in the "Elim." "Tore Zahab" (Plaits of Gold), selections from Hebrew literature, with a commentary entitled "Neḳudat ha-Kesef." "Tor ha-Ma'alah" (Order of Dignity), on the treatment of scholars. "Ruaḥ Eliyahu," a defense of Elijah Mizraḥi's commentary on Rashi. On Porphyry's "Introduction to Logics," and on the "Categories." Translations of several of Philo's works and of Judah Abravanel's "Philon et Sophia." Explanations of difficult passages in Isaac 'Aramah's "'Aḳedat Yiẓḥaḳ." Comments on Ibn Ezra's "Sefer ha-Shem" and "Sefer ha-Eḥad." "Arubbot ha-Shamayim" (Windows of the Heavens), on metaphysics. "Raḥel Mebakkah," and a number of other works upon unknown subjects. "Elim" (Amsterdam, 1629) contains answers to twelve scientific questions propounded by Zerah ben Nathan, and seventy mathematical paradoxes. The title is an allusion to Ex. xv. 27. The work also contains some letters of Zerah ben Nathan, and dissertations by one of Delmedigo's disciples, Moses ben Meïr of Metz. "Ma'yan Gannim" (Source of the Gardens), a continuation to the answers to Zerah ben Nathan. It consists of the following short treatises: on trigonometry; on the first two books of the "Almagest"; on astronomy (these three printed with the "Elim"); on astronomical instruments; on Cabala and the supernatural; on astrology; on algebra; on chemistry; on the aphorism of Hippocrates; on the opinion of the ancients concerning the substance of the heavens; on the astronomy of the ancients, who considered the motion of the higher spheres due to spirits (Delmedigo shows that their motion is similar to that of the earth); on the principles of religion; mathematical paradoxes (printed together with the "Elim"). 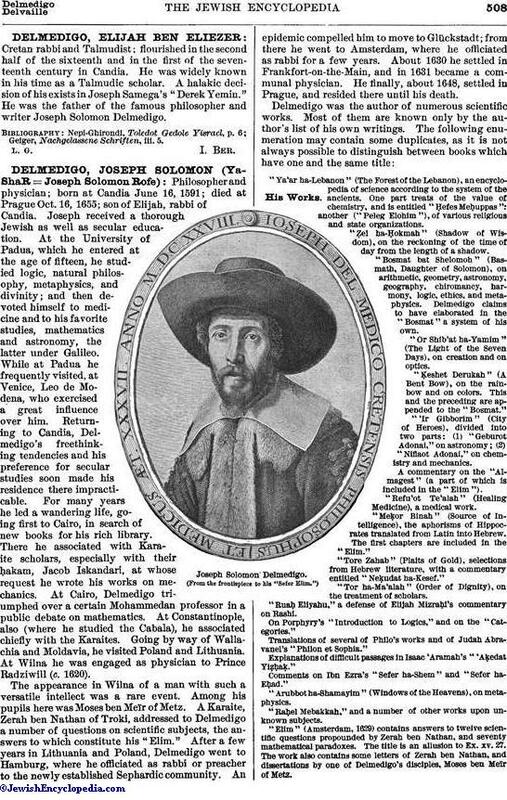 Another of Delmedigo's disciples, Samuel Ashkenazi, published under the title of "Ta'alumot Ḥokmah" (Basel, 1629-31) that portion of the "Ma'yan Gannim" which deals with the Cabala. This work shows that Delmedigo was a follower of the system of Isaac Luria. Geiger has published ("Melo Chofnajim," Berlin, 1840), with a German translation, one of Delmedigo's letters to Zerah ben Nathan. 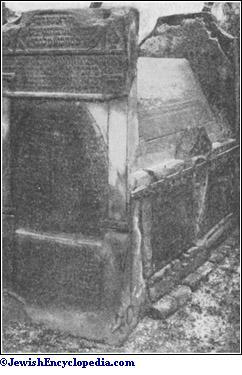 Tombstone of Joseph Solomon Delmedigo at Prague. Despite Delmedigo's scientific attainments, he is to be blamed for deriding the Cabala in private and defending it in public, even if Michael's supposition be correct that the letter addressed to Zerah contains interpolations by Karaites, among whom it was found. Evidently ashamed of his "Maẓref le-Ḥokmah," he asserted that it was written at the request of an influential personage in Hamburg who wished to defend philosophy, and that an author is not bound to state his private belief in such cases. His lack of sincerity is also seen in some evidently false statements; for instance, regarding the miracles worked by Naḥmanides and Ibn Ezra. He was so afraid of being accused of heresy that he covered the discussions on scientific and theologic questions in his "Elim" with the cloak of orthodoxy, and attributed his own opinions to Zerah or to Moses b. Meïr of Metz. It was probably this fear that caused him to suppress the treatises on angelology and Cabala in his "Ma'yan Gannim." 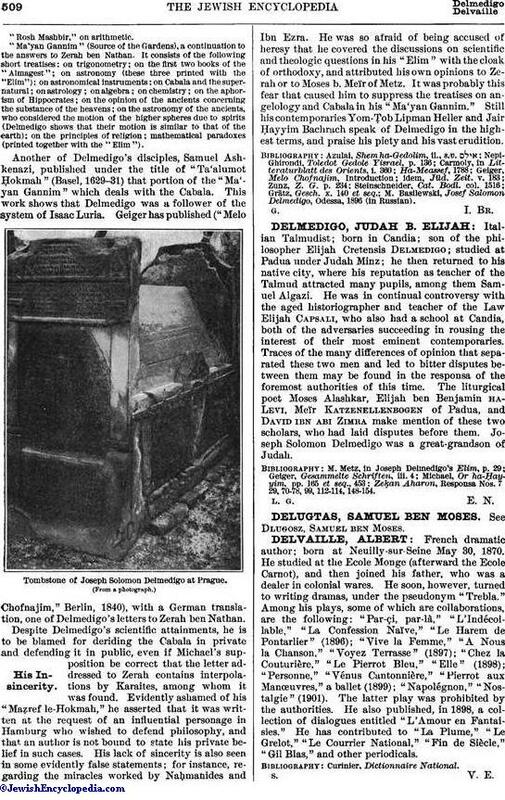 Still his contemporaries Yom-Ṭob Lipman Heller and Jair Ḥayyim Bachrach speak of Delmedigo in the highest terms, and praise his piety and his vast erudition. M. Basilewski, Josef Salomon Delmedigo, Odessa, 1896 (in Russian).